Following the anti-dumping and countervailing measures imposed by the United States on Chinese and Taiwanese solar PV manufacturers, the European Union is now investigating other Asian countries for allegedly helping China violate the terms of a solar-export agreement it has with the EU, said Jason Huang, a research manager at EnergyTrend, a division of the Taiwan-based market intelligence firm TrendForce. The European Union and China previously reached an agreement that allows solar panels from China to be sold to Europe in limited volumes at a fixed price, but EU ProSun, a joint initiative of European solar businesses, alleges that other countries are importing unfinished Chinese solar products, putting the finishing touches on them and then exporting the products to Europe he said, adding that South Korea, Malaysia and Taiwan are currently being investigated. In June, EU ProSun presented documents to the EU Committee that alleged Chinese solar products were being sold to Europe for less than the minimum price China and Europe had agreed upon. EU ProSun said that China went through multiple channels to sell solar products to Europe for below the agreed minimum. The EU Committee rejected EU ProSun’s allegations, but in August, when it was rumored that new anti-dumping investigations would be launched, many manufacturers clarified their statements and denied they had been investigated. But recently some manufacturers have confirmed that they are being investigated and say they are complying with investigators. “If Asian manufacturers are guilty of helping Chinese solar firms circumvent the agreement China has with the EU, the EU may impose a 47% duty on all of their solar exports, as they did previously to Chinese manufacturers,” Huang said. Since a new minimum price of solar products exported from China to Europe has not been announced officially, the price for the fourth quarter may be lower than the price set in April, which was 0.53/watt. Meanwhile, Taiwanese manufacturers have cost advantages in the European market. To avoid being hit with anti-dumping levies, they are trying to clarify that they don't help Chinese makers to circumvent the minimum price agreement. 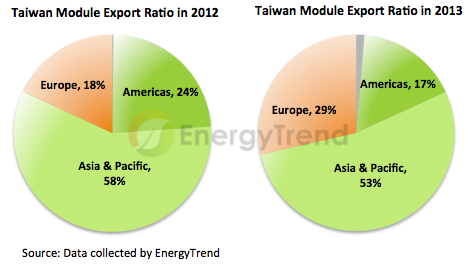 Data show that Europe accounted for 18% of Taiwan’s overall module exports in 2012 and 29% in 2013. Europe is Taiwan’s second-largest module export market. Japan is the largest. Meanwhile, since the US’s decision on the countervailing act on China’s solar exports will be postponed, a decision on the anti-dumping act will be postponed as well. That was originally scheduled to be announced in mid-December. For now, it is essential that the US and China come to a minimum price agreement similar to the one between China and Europe. The results of the agreement will not only affect the US solar market and Taiwanese and Chinese manufacturers, but will have a major impact on the global solar supply chain, Huang said. As a result of the anti-dumping and countervailing duties, there were some urgent purchases and considerable price fluctuation in the supply chain. However overall, the price for polysilicon was stable. Some silicon wafer prices moved 0.5% and monocrystalline silicon wafer prices dropped the most. China cell prices rose 0.31% to US$0.319/W while Taiwan cells decreased 0.9% to US$0.332/W. This is a concern for the Taiwan cell market as it is nearly November. Modules prices in China are stable as is demand for modules.